All the cuts from half a pig. 55 lbs. Buying half a pig saves money over purchasing by the individual cut and it will stock your freezer for all types of cooking, from summer grilling to holiday roasts. If you are serious about eating healthy, clean meat on a regular basis this is a great way to go. Approximately 20 lbs of ground/sausage. ** You tell us which type and how much of each you want. We'll use this category to fill out the order to the entire 55 lbs. Each cut will be cryosealed and labeled to make identification easy. **Bacon and Sausage packages all come in roughly 1 lb amounts. Purchase two half pigs at the same time and we'll take take an additional 5% off the final price. 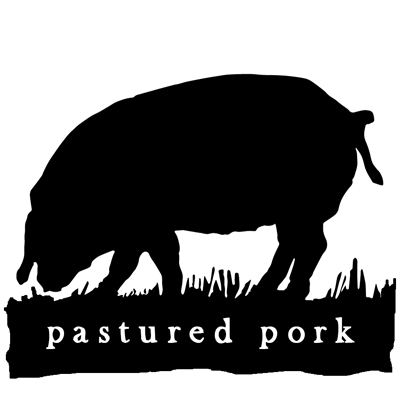 We deliver pastured pork, grass-fed beef, grass-fed lamb and pastured poultry to Bryn Athyn, PA, Cooperstown, NY, Chestnut Ridge, NY, Franklin Lakes, NJ and Parsippany, NJ.